Love this magnet! Love it! It reminds me of a friend of mine, whom I've known since junior high. Head either buried in a book, or bent over sewing fun animals on her jeans, she was the smartest girl in the class, flautist extraordinaire, and one of the most interesting chicks in school. And, I'm not just sayin' it cuz she's the one who made me this collage magnet. It's just I would never have thought to repurpose old scraps of papers, letters, etc., to create something new and supercute. 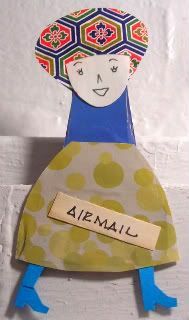 She mentioned that the AIRMAIL was actually taken from something of her father's. Supersupercute! It's like the really cool stuff we saw at the Museum of Art & Design a couple of days ago. The exhibition is called "Second Lives" and it's basically a bunch of pieces where artists took every day items and created something new from them. A great description, and accompanying photos are here, but it really was a supercool exhibit. There was a chandelier, made of old eyeglasses - called Spectacle. Or, the chair made of quarters. (Mind you, I could have washed a ton of clothes with those quarters, but it was still cool.) One thing that particularly made an impact on me was the coat of armor that was made entirely out of dogtags, something like 3,000 of them! There was one installation called My Back Pages, where this one guy, an artist named Villinski, took old 45s of his favorite songs, and created a flight of butterflies from them. Just before he would add the record to his installation, he would play it one last time, a bit of a eulogy for them. While I was mad at the MAD for not having a ton of MAD tchotchkes set up in their little shop, and for charging a little too high for an hour, I really did enjoy the Second Life exhibit. Makes you think about the stuff you're throwing way every day...and want to donate it to someone to make something new from it.